My mother has this amazing skill for being able to just throw random things together in a pot and make it taste nice. I cannot for the life of me understand how she does it. I can cook things fine, but throwing things in a pot and producing a yummy meal is beyond me. I’m getting better at it, but some nights (like tonight) everything goes wrong. I needed to make dinner for my parents and boyfriend. I’m big on using up leftovers (I think interning at Ecobomb had a bad effect on me) and there was some veg that was about to go off in the fridge. I decided I’d try and do a throw-it-all-in-the-pot, just like my mum does so effortlessly. I was going to chop up the veg, mix it in with pasata, layer it over Skinny Chips and serve with meatballs. Sounds yummy, but went totally wrong. 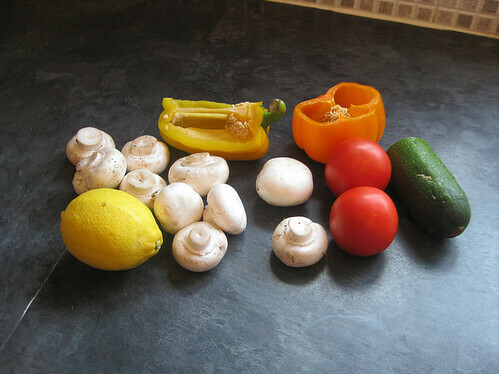 I had all the above as leftovers, and I added some a red pepper, a green pepper, another courgette and an onion. Chopped everything up, fried the peppers and the mushrooms, put the courgette and the lemon in a saucepan and added two cartons of pasata. When the veg was fried I added that to the pasata along with some mixed spice and some garlic. So far, so good. I then started to make Skinny Chips. I’ll put a recipe up for these at some point, but for now they start by boiling for five minutes. Unfortunately I was distracted. They ended up cooking for 30 minutes and turning into a big sloppy gloop. Not good for making chips. So I called my father in the kitchen to mash them (he is potato-masher in residence) and then got the meatballs out of the fridge. I shallow fried them and the onions together as quickly as possible, put everything in three separate piles on plates and served. And it tasted a bit bleh. The pasata mix was alright, mainly because of the lemon (adding a lemon to anything like this makes such a difference – SO yummy) and the meatballs tasted yummy. The mash was as creamy and lush as you could hope for. But the whole thing just didn’t taste very good. I don’t think it worked well together. The Skinny Chips and the pasata would have complimented each other, especially with a little chilli powder, and the Skinny Chips would have given the whole thing more texture…I suppose I should have binned the potatoes and just added rice, but I hate wasting food. Sigh. What a mess. On the plus side, chopped veg can be very pretty.